A Korean twist on the beloved classic, grilled cheese! Korean fusion dishes like tacos, grilled cheese, and quesadillas have been popping up everywhere, so I had to give it a try at home. To marinate the kalbi, a minimum of 3 hours is needed, but overnight would be even better. I experimented by making this with stir-fried kimchi and fresh kimchi, but I preferred the fresh one. You could choose either one, depending on your preference, but I thought the freshness of the kimchi (although it was still slightly cooked from being on the grill) balanced the hearty bread, cheese, and the kalbi. For the grilled cheese, you can use a grill, panini press, or grill pan, which would all give you beautiful grill marks, or if you don't have those, you can use a skillet and place a heavy skillet or pan on the sandwich. Be sure to generously butter the outside of the sandwich on both sides, as this will give you a crisp, crunchy bread that is still soft on the inside. Read this [link] for the anatomy of a good grilled cheese! 1. Mince the garlic and slice the green onions. In a bowl, mix together the soy sauce, sugar, sesame oil, garlic, green onions, and sesame seeds. 2. If your steak if on the thicker side, pound the meat thin. You do not need a meat tenderizer to do this! Wrap 2 sheets of plastic wrap around the steak, and pound away with a hammer! Very cathartic. 3. Place the steak and the marinade in a gallon size Ziploc bag. Marinate for at least 3 hours or overnight, turning occasionally. 4. Heat olive oil in a large skillet and cook the steak over medium-high heat (around 7 heat level out of 9). Flip only once, cooking about 3-4 minutes per side. This will give you a nice medium-rare finish, and the steak will also cook a little bit on the grill. Let the meat rest for 5-7 minutes or so, and then carve into thin slices. 5. While the steak is cooking, if you wish to use stir-fried kimchi, saute the kimchi on medium-high heat for about 7-10 minutes, stirring occasionally, until the kimchi just begins to brown. 6. Heat your grill, grill pan, skillet, or panini maker to medium high heat. 7. Generously spread the butter on the bread (the outer sides that will be touching the grill). 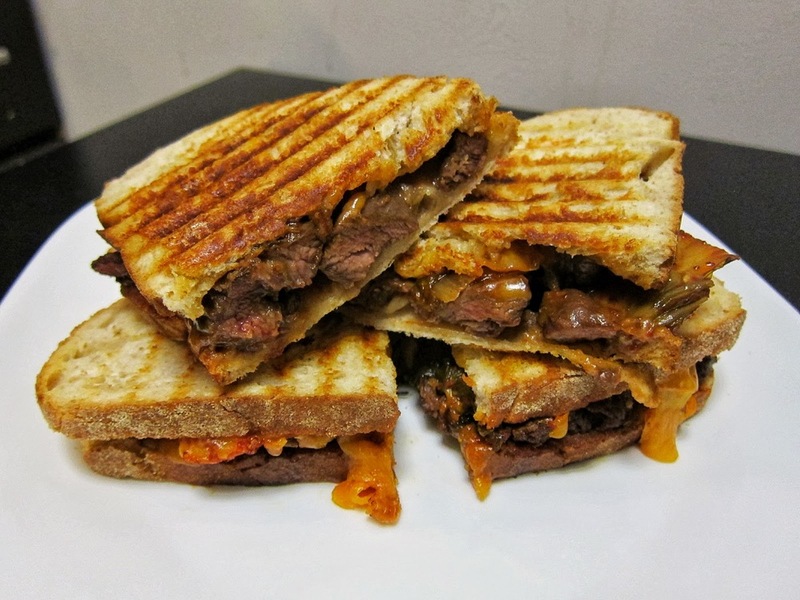 Take one piece of bread and place the steak, kimchi and cheese (in that order) on the non-buttered side. Place the second piece of bread on top. 8. Grill until the cheese is well melted and the sandwich is crispy and golden brown on the outside. Allow to rest for a few minutes, cut in half, and enjoy!